Hand Cut Atlantic Salmon Fillets! 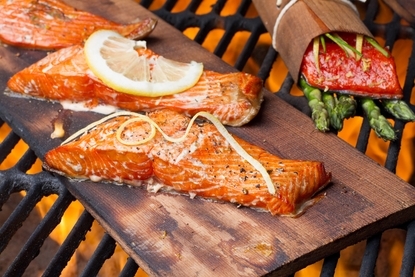 Baked, Broiled or Poached, this very popular fish is great tasting and good for you! Fillet and hand cut By Fisherman to ensure great quality! Seafood Entrees • Hand Cut Swordfish Steaks! • Baked Stuffed Jumbo Shrimp! Premium Center Cut Salmon Fillets are cut fresh and frozen right away to ensure their great taste! Baked, Broiled or Poached, this tender flavorful fish is great tasting and good for you! Our Salmon Makes A Great Gift Idea, for Holidays, Anniversaries, Birthdays, or just a Great Thank You! Order Your Atlantic Salmon By 10am EST, And Enjoy Them For Dinner Tomorrow! Salmon Also Make A Great Gift Idea For Your Favorite Seafood Lover! How Easy Is That! You can place your order easily online or by calling us toll free at 866-788-0004. We ship Monday thru Thursday for delivery on Tuesday thru Friday (NO Sunday or Monday delivery). Very nice Salmon! No Bones, and the perfect portion size! We ordered the Salmon, and Lobsters and a bunch of other things for gifts. We had the salmon ourselves and I must say it was quite good! Nice selection of seafoods, and it all came expertly packed, The quaility was very good ,and the Salmon was great on the grill! The Salmon was very good,the lobsters even better. thank you, we will order again.